Following a successful event at the Stormont Hotel last year we are looking to build on that success this year. With our new branding, pick and mix boxes, product labels and take home packaging we have given our now established product range an attractive, uniformed and easily identifiable makeover. Why not come and take a look? 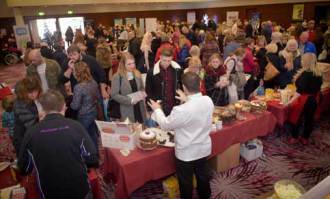 Suppliers of cakes, tray-bakes, muffins, scones and desserts to the trade, retail and private clients. Gluten, Wheat, Dairy, Lactose, Soya, Egg, Sugar Free diets catered for as well as Vegan Diet friendly options.